Considerable improvements for the security and operational efficiency of Operational Technology (OT) devices are attainable through the implementation of TrustCentral’s innovative technology. 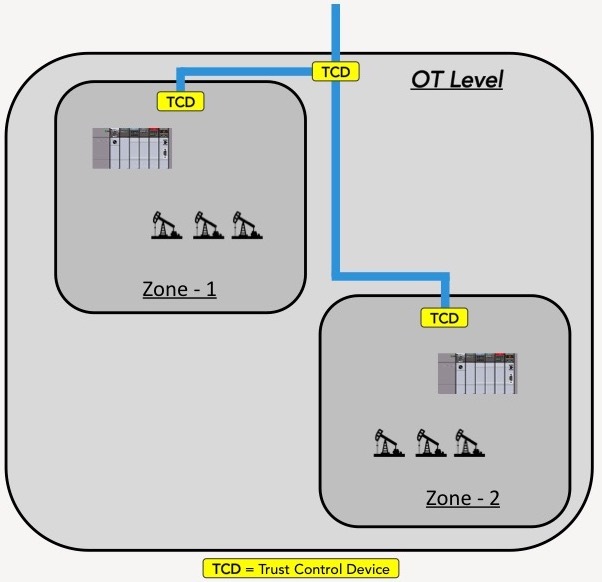 Not only may OT achieve new levels of control and protection of its legacy devices, but OT can also obtain a secure method of delivering IoT Analytics data directly to legacy devices in the field for their enhanced operational and financial performance. The following covers these problems with TrustCentral’s solutions. Information Technology (IT) supports connections to the Internet plus related data and technology systems; focused on the secure flow of data across an organization. Operational Technology (OT) monitors and controls devices and processes of physical operational systems (e.g., assembly lines, utility distribution networks, production facilities, roadway systems, and more). IT environments have experienced a wide variety of cyberattacks and security threats for many years. Over this period much has been learned and a variety of mitigations have been deployed in a continuous process. OT has had a different history as OT systems have generally been kept isolated, not only from the Internet but from other networks as well. Therefore OT systems have not had the duration or quantity of cyberattacks as IT has experienced. The result is that OT has not identified as many attacks nor developed as many mitigations as IT has. It is important to note that the physical consequences of cybersecurity incidents in OT environments can represent, not only damage to equipment, infrastructure, and the environment, but also injury and loss of life to personnel. Also an attack to the OT environment can represent an immediate and costly shut down of an enterprise’s production operations. Attack tools are getting more and more advanced making attacks easier to carry out. The Internet facilitates the distribution of attack tools, making them more available and obtainable. The challenge for OT is compounded by: (a) many legacy systems and devices not having been designed or developed with high level security capabilities; (b) many existing devices having security vulnerabilities and need to be protected; (c) upgrading devices is generally capital intensive; (d) historically the investment in security upgrades for OT has been much lower than IT; (e) in OT expected life spans of systems can be measured in decades; (f) protection is difficult; (g) the risk of malicious code and attackers is real; (h) and more. Widely adopted frameworks enforce OT’s isolation from IT. The Purdue Model for Control Hierarchy is the most prevalently used in a number of industries. 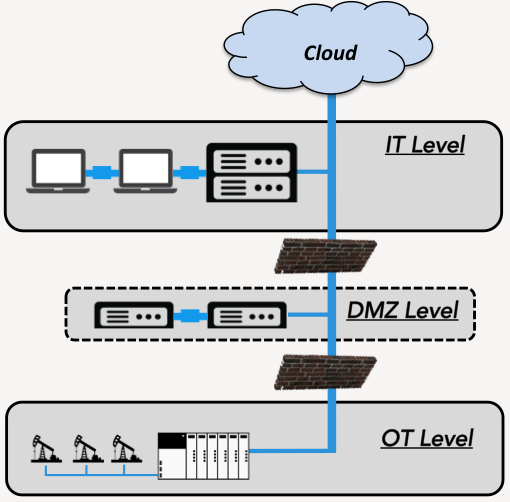 Under this model, IT and OT domains are put in separate zones, isolated by way of a demilitarized zone (DMZ). This creates complex walls between systems and complicates an OT network. Significant value can be gained from analyzing IoT data. Not only is IoT’s value partially in the ability to connect IoT devices, but its value also comes from the understandings gained from IoT device data. Because of this, the field of IoT Data Analytics has gained prominence and value to IoT. For example, in the oil and gas industry it is estimated that 10-15% operational efficiency may be gained from the use of IoT Data Analytics, but it is generally being lost due to OT isolation. Isolation can cut OT off from benefits of machine learning and artificial intelligence. There are significant challenges to be overcome for meaningful improvements to OT security. Any solution should be built on a foundation of Public Key Infrastructure (PKI – the foundation of security for the Internet). A solution must support the authentication, security and trustworthiness of IoT devices, other endpoints as well as their data. What is needed is a new security and control device. A properly designed “Trust ControllerTM” device can help. It must leverage the trust and security of PKI. It must support strong authentication, security, control and other features. 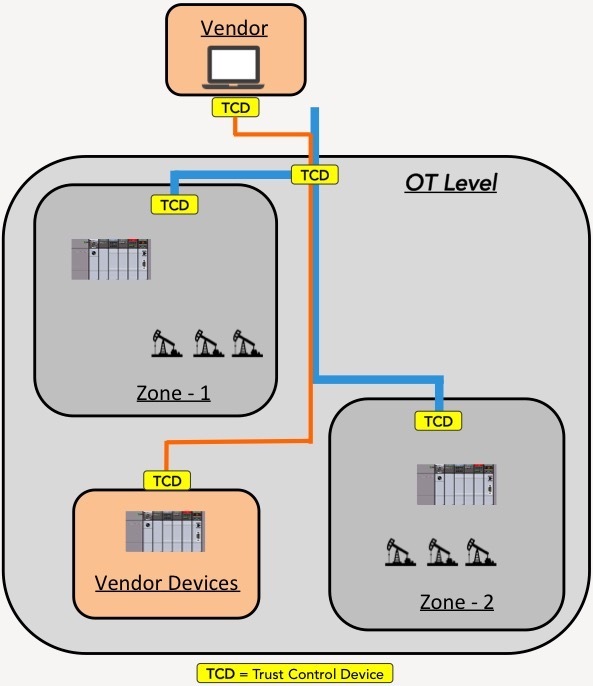 Any controller device must be easily integrable into existing OT environments without the need for IT support to modify networking configurations. A Trust Controller device (“TCD”) is a hardware component that will integrate with TrustCentral’s software component in order to achieve an overall, desired result. From the software side, the key elements of TrustCentral’s technology solution focus on TrustCentral’s “Building Blocks”. DEVICE SETUP RESULTS: an efficient sales and distribution process is facilitated through a managed, cryptographically-secure process; licensed services are activated on a per-device basis in a precise, controlled manner; only authorized, registered devices may connect to cloud resources and interact for properly licensed services. Data collected is trusted because its provenance has been established through the use of cryptographic tools. 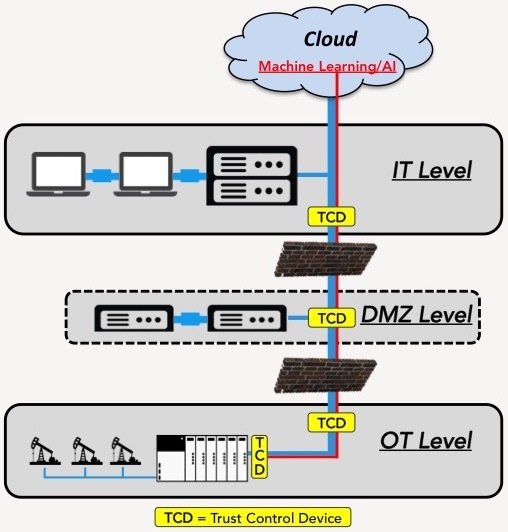 Provide a tightly defined, authenticated and secure method to penetrate the Purdue Model OT-IT isolation barrier in order to securely deliver real-time instructions directly to legacy field devices (e.g., oil pumps) so that OT operations can benefits from artificial intelligence and machine learning capabilities (in a cloud or IT platform) with a result of improved efficiency, lower costs and higher margins. Rely on the Trust Controllers to only exchange data with another paired Trust Controller such that the two controllers have an existing, authenticated, persistent, secure communication line between them. Secure vendor remote access to supported devices. Provide limited, authenticated and secure access specifically to only those legacy devices for which that vendor is responsible. Digital Audit trails support data integrity through the system’s optional ability to provide authentication, reputation metrics and end-to-end audit trails (trusted transactions).This feature will likely not be part of the MVP. TrustCentral’s IoT technology will be valuable for multiple areas of IoT, including security, the intersection of IoT and blockchain, etc. One of the major purposes of an Industrial Control System is its output of transactions and event records to be stored in a database. Whether that database is a blockchain or not, the trustworthiness of those records is critical. Blockchain transactions and event records are immutable, but if one can’t trust their provenance [the source from which they came and how they got there] how valuable are they? In a paper published in 2017 by the IEEE entitled “Transaction Immutability and Reputation Traceability: Blockchain as a Platform for Access-controlled IoT and Human Interactivity”Dr. David Kravitz addresses the above challenges directly. To achieve trustworthiness of IoT data for blockchain recordation, in his IEEE paper Dr. Kravitz relies on technology that he designed for TrustCentral (e.g. an “Inviter-Invitee” protocol, “communication lines” between endpoints; Trustworthiness and Reputation metrics; etc.). This IEEE paper cites TrustCentral patents and includes five figures from a TrustCentral patent. For more information on enhancing trust for IoT transactions, please see TrustCentral’s page on Blockchain. Using the technology of its Building Blocks, the TrustCentral API will offer unique and valuable services for the security, privacy, control and management of OT devices. TrustCentral’s solution is designed to support a cooperative and coordinated relationship between Operational Technology and Information Technology by providing both OT and IT targeted technologies to meet each of their needs.